The gastric phase is a period in which swallowed food and semi-digested protein ( peptides and amino acids ) activate gastric activity. About two-thirds of gastric secretion occurs during this phase. Ingested food stimulates gastric activity in two ways: by stretching the stomach and by raising the pH of its contents. Stretching activates two reflexes: a short reflex is mediated through the myenteric nerve plexus; and a long reflex is mediated through the vagus nerves and brainstem. Acetylcholine (ACh). This is secreted by the parasympathetic nerve fibers of both the short and long reflex pathways. Histamine. This is a paracrine secretion from the enteroendocrine cells in the gastric glands. Gastrin. This is a hormone produced by enteroendocrine G cells in the pyloric glands. All three of these stimulate parietal cells to secrete hydrochloric acid and intrinsic factor. The chief cells secrete pepsinogen in response to gastrin and especially ACh, and ACh also stimulates mucus secretion. As dietary protein is digested, it breaks down into smaller peptides and amino acids that directly stimulate the G cells to secrete even more gastrin: this is a positive feedback loop that accelerates protein digestion. Small peptides also buffer the stomach acid so the pH does not fall excessively low. As digestion continues and these peptides empty from the stomach, the pH drops lower and lower. Below pH of 2, stomach acid inhibits the parietal cells and G cells: this is a negative feedback loop that winds down the gastric phase as the need for pepsin and HCl declines. The gastric phase of digestion: During the gastric phase, gastrin is secreted. The stomach stretches and churns while enzymes break down proteins. The gastric phase accounts for about two-thirds of gastric secretions. Ingested food stimulates gastric activity by stretching the stomach and raising the pH of its contents; this causes a cascade of events that leads to the release of hydrochloric acid by the parietal cells that lower the pH and break apart the food. Gastric secretion is stimulated chiefly by three chemicals: acetylcholine (ACh), histamine, and gastrin. 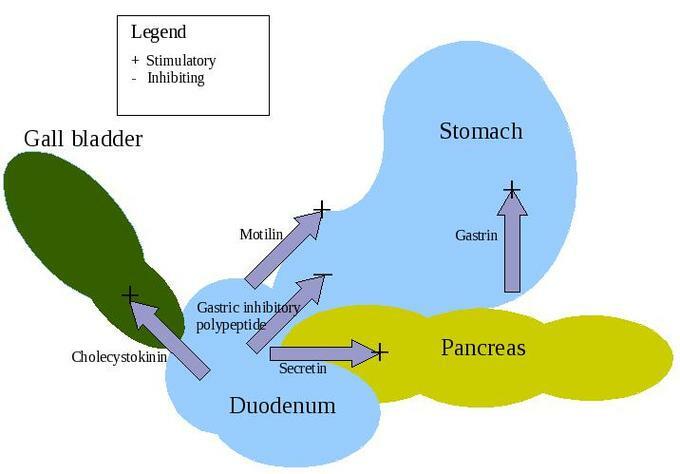 Below pH of 2, stomach acid inhibits the parietal cells and G cells; this is a negative feedback loop that winds down the gastric phase as the need for pepsin and HCl declines. gastric phase: The second phase of digestion that follows mastication (chewing) and takes place in the stomach.